Leaders of the BNP-led 20-party alliance on Monday welcomed the new opposition alliance, Jatiya Oikya Front. 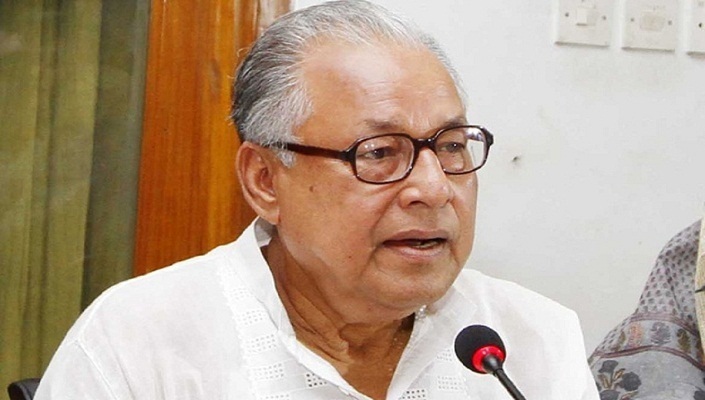 BNP standing committee member and 20-party coordinator Nazrul Islam Khan came up with the remark while briefing reporters after a meeting of the alliance’s top leaders at BNP chairperson’s Gulshan office, reports UNB. “Our meeting discussed the demands and targets of the Jatiya Oikya Front. We reached a consensus that the formation of the new alliance is a progress towards restoration of democracy by removing the autocratic regime,” he said. “That’s why we, on behalf of the 20-party, welcomed the new front,” Nazrul added. He said the 20-party leaders hoped that people’s movement for forcing the government to accept their justified demands for holding the next election under a non-party administration will be intensified in the days to come with the formation of the Jatiya Oikya Front. The 20-party coordinator also said the alliance leaders thanked the Oikya Front for including Khaleda Zia’s release from jail in their 7-point demand. On Saturday, BNP together with Dr Kamal Hossain-led Jatiya Oikya Prokriya, Jatiya Samajtantrik Dal (Rob) and Nagorik Oikya started the journey of Jatiya Oikya Front through a press conference at the Jatiya Press Club. Top leaders of the 20-party, including BJP chairman Andalib Rahman Partha, Kalyan Party chairman Syed Mohammad Ibrahim, Jamaat-e-Islami’s Abdul Halim, Islami Oikya Jote’s AMA Rakib, Khelafat Majlish’s Ahmad Abdul Kader and LDP’s Redwan Ahmed were present at the meeting chaired by BNP secretary general Mirza Fakhrul Islam Alamgir. Talking to UNB, a 20-party leader, wishing anonymity, said some 20-party leaders wanted to know from the BNP leaders about how the 20-party alliance’s future course of action after the party’s involvement with another alliance. They also seek an explanation from the BNP leaders about what would be their role in the next election and different programmes to be announced by the Jatiya Oikya Front. He said Fakhrul assured the alliance leaders that the importance of the 20-party will not diminish due to the formation of the Oikya Front. “Our future programmes can be separate or simultaneous ones. The 20-party will work together with the Oikya front based on same demands and goals. The role and importance of the 20-party will remain same as it was in the past,” the 20-party leader quoted Fakhrul as telling the meeting.